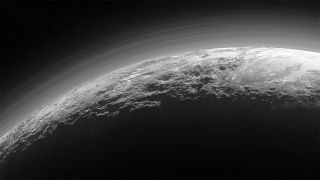 Since whizzing past Pluto back on July 14, Nasa's New Horizons probe has sent back a wealth of data about the distant icy world. This week, researchers are announcing more than 50 sensational discoveries from that data at the 47th Annual Meeting of the American Astronomical Society's Division for Planetary Sciences. First up, there are the cryovolcanoes - these are volcanoes that belch out a slurry of ice, nitrogen, ammonia or methane, rather than fire. New Horizons has spotted two potential candidates, each measuring tens of miles across and several miles high, with a hole at their summit. Then there's the surface of Pluto itself. It has regions with loads of craters that date to just after the formation of the solar system, but it also has other regions that are completely crater-free - suggesting that they formed within the past ten million years. All this is evidence that Pluto is geologically active, and has been throughout much of its 4-billion-year lifespan. There are also relatively few small craters on the surface, suggesting that there are fewer smaller objects whizzing around in that area of space, known as the Kuiper Belt. That discovery has led to a rethink of Pluto and other nearby bodies formed - Kuiper Belt objects may have been "born large", which is exciting because it means they can tell us much more about the conditions in the solar system when they formed. Oh, and Pluto has some seriously weird moons. The rotation of almost every other moon in the solar system is locked to the object it's orbiting - that's why we always see the same face of our Moon, and never see its 'dark side'. But the moons of Pluto are spinning way faster, and wobbling too. That suggests that there were probably more of them in the past, and several have merged at some point, perhaps violently. "It's hard to imagine how rapidly our view of Pluto and its moons are evolving as new data stream in each week. As the discoveries pour in from those data, Pluto is becoming a star of the solar system," said mission Principal Investigator Alan Stern. "Moreover, I'd wager that for most planetary scientists, any one or two of our latest major findings on one world would be considered astounding. To have them all is simply incredible." Nasa's director of planetary science, Jim Green added: "The New Horizons mission has taken what we thought we knew about Pluto and turned it upside down. It's why we explore -- to satisfy our innate curiosity and answer deeper questions about how we got here and what lies beyond the next horizon."